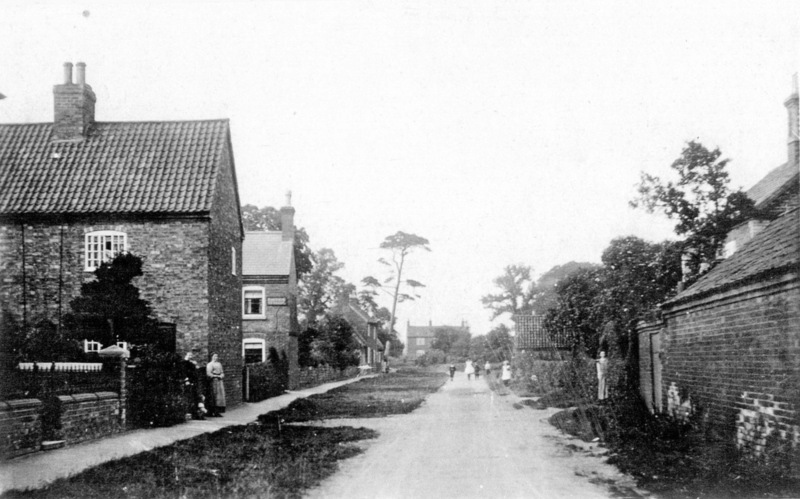 An initial search of the census for men named Albert Kirk born between 1880 and 1900 yielded 15 results for those born in Lincolnshire, including an Alfred Kirk born in 1881 at Great Gonerby and recorded there in the 1881 and 1891 censuses. Leicestershire returned a further 10 results and Nottinghamshire 24, but none were at locations close to Bottesford or Muston. However, this was superceded by a repeat census search which revealed that there was an Alfred Kirk born in Bottesford about 1877. In the census of 1891 he is a fourteen year old living with his family at 4 Back Street (Albert Street), Bottesford. His parents were John Thomas Kirk, a railway signalman born 1846 at Bingham, and Eliza Kirk, born about 1846 at Honington, Lincolnshire. They had three sons: John William, a railway porter born about 1870 at Bottesford; Alfred, born at Bottesford; Albert Ernest, born in 1889 again at Bottesford. The parish register for Bottesford records an Alfred Kirk who was christened on 2nd September, 1877, son of signal man John Kirk and his wife Eliza. The General Register of Births, Marriages and Deaths records the birth of Alfred Kirk, Grantham district, in the 2nd quarter of 1877, and the marriage of Alfred Kirk to Mary E. Claricoats at Grantham in the 2nd quarter of 1903. Unfortunately no unambiguous record of his death was located. 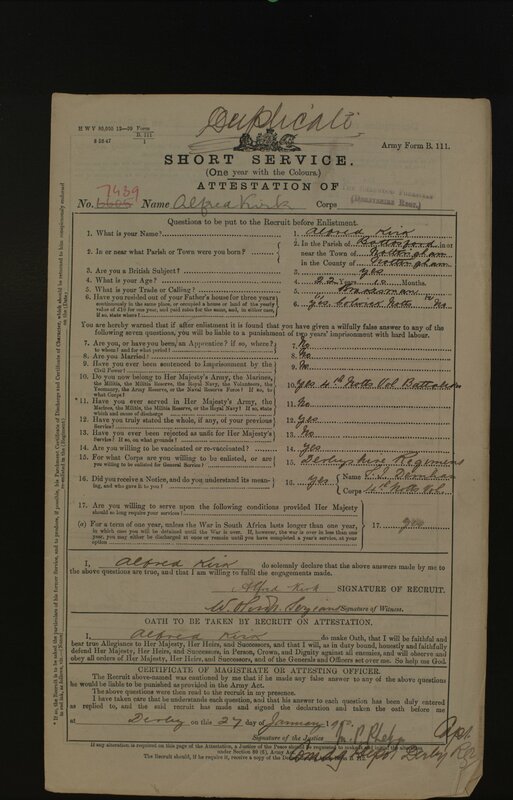 The search of military Service Records located the following information about Alfred Kirk. He was born at Bottesford, Nottingham, and worked as a railway brakesman. At the time he attested he was living with his father at Colwick, Nottingham, and had already been a member of 4th Notts Voluntary Battalion. He attested at Derby on 27th January, 1900 (then aged 23), as Private 7439, Derbyshire Regiment (Sherwood Foresters). He was posted on 23rd February, 1900, and fought in South Africa (Boer War), being discharged on 13/1/1901. On his service papers there are two service numbers: 6605 was written first and was later crossed out and the number 7439 inserted.The significance of this amendment is not stated. Perhaps the later entry is the number he received when he re-enlisted in WW1? This information is very incomplete. Unfortunately, no accompanying records of his later service were displayed in the military search results. Nevertheless, the mere fact of his inclusion in the Bottesford ‘church organ’ list of names of men who served indicates that he did serve in WW1, possibly re-enlisting into the Sherwood Foresters. He was 37 when the war broke out, and 41 when it ended in 1918. His absence from the War Memorial and from CWGC records tells us that he survived, but a search for him in the electoral rolls from 1921 to 1925 produced no clear identification. It is hoped that more information will be located in due course, and we would be most grateful for any help that we might receive in this search. Two service numbers were recorded. The earlier one, 6605, was crossed out and replaced by 7439. The reason for this alteration was not indicated.